Your social networks aren’t just there for arguing politics with your uncle or looking at your neighbor’s lunch—they’re also good for the serious business of finding your next place of employment. Here’s how to perfect your searching on each of the major networks to maximize your chances of landing your dream job, or something close to it. Trying to find jobs on social media isn’t difficult, especially on LinkedIn, which is partly built around the idea. But cutting through the noise and finding the opportunities that are right for you, or the positions that are really going to interest you, can be a challenge. Three of the big-name networks can be very useful for job-hunting, but they all work in slightly different ways. Before you start hunting for jobs, you need to do some serious housekeeping on your own social media feeds—these are the pages potential employers are going to be looking at, especially if you’re applying through one of these platforms. Late-night arguments with celebrities and a digital trail of debauchery probably aren’t going to go down too well. Finding your Twitter profile and scrolling through for dubious content isn’t too difficult to do, and tweets can, of course, be deleted individually. Free services such as Cardigan and Twoolbox help you take more drastic action. They’re not the only services out there—Lifehacker has a full guide to the cleaning process, though you might want to save a local copy of your tweets first (the download archive option is in your account settings). Facebook has post visibility controls that are much more granular and it’s unlikely that you’ve posted much that’s publicly viewable by everyone. To check, open up your profile page, click the small three-dot button on the right of your cover picture, and choose View As, which will show you how your profile picture looks to a passing potential employer. You can delete any post via the three-dot button on the right. Bulk removal tools are available, usually in the form of browser extensions—Social Book Post Manager for Chrome and Facebook History Cleaner for Firefox are two examples—but these tend to be less reliable and less well maintained than the Twitter equivalents (perhaps because Facebook is a much more complex beast). If you really want to hide a lot of Facebook posts, it’s probably easier to just deactivate your account temporarily and then come back to it once you’ve got the job. Getting a job probably isn’t the first reason you open up Facebook in the mornings, but beyond the inane updates from friends and family there’s more to the world’s biggest social network than you might realize: Groups for job seekers, company profiles, and (as of last year), official job boards for your area. You can even apply to Facebook itself, if you fancy having Mark Zuckerberg as a boss. You can start with Facebook’s dedicated jobs portal, which should default to your local area—you can adjust the search parameters down the left if needed. It’s not all that widely used right now though, so you might have to get a bit more creative if you’re going to land the job of your dreams. If you do find something you can apply straight through Facebook for jobs advertised in this way, though only the basics of your personal information are shared. You’ll be happy to learn it doesn’t give your possible employer access to any of your posts you haven’t made public. A simple search for “jobs” turns up actual jobs in your area, plus groups and pages advertising jobs, though again the quality varies—use the location and date filters down the left-hand side to narrow down your search. It really does depend what you’re looking for and where you are, but the Groups and Pages tabs of the search results can turn up some useful leads, especially if you add in more specific keywords. Employment opportunities are very often posted on a company or organization’s official Pages, so following a few of your preferred employers is a good start in your Facebook job hunt, whether that’s a conservation agency or a global accounting firm. Click Like or Follow on a Page to have that company’s updates appear in your News Feed in the future. This is perhaps the best approach for looking for jobs on Facebook, and it’s worth following companies even if you’ve found a role advertised on a different site: Their Pages will give you a good idea of the firm’s philosophy and values, and could give you a few tidbits of knowledge that are useful to take into an interview (like a recent marketing campaign or a newly unveiled headquarters). Don’t neglect the networking aspects of Facebook either—hit up contacts you know working in the industry you want to get into and don’t be afraid to throw up a speculative request asking if anyone knows of any opportunities, because your network of friends and relatives might be better at crowdsourcing some leads than you might think. That said, Facebook isn’t really a professional networking tool, so it’s probably not a good idea to randomly throw in a friend request to the person who’s about to interview you. On Twitter you’re going to find far more feeds dedicated to advertising jobs than you will on Facebook, whether that’s for NPR or the city of Toronto. 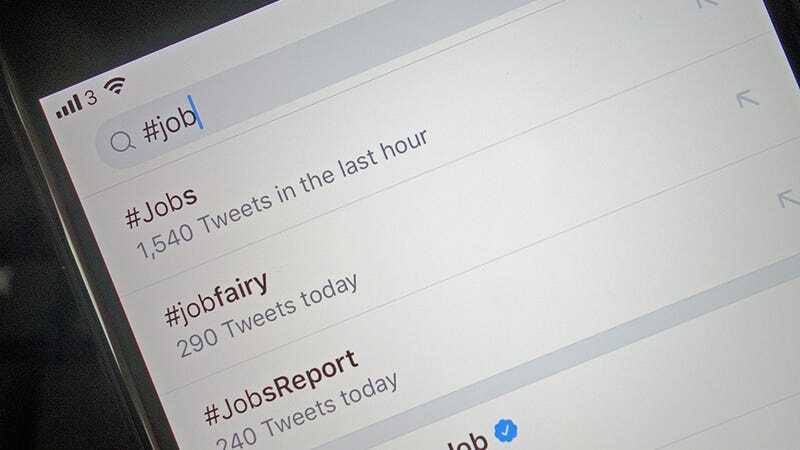 Put “jobs” into the Twitter search box at the top of your timeline, hit Enter, then switch to the People tab—Twitter should make some good suggestions about job-related accounts you can follow based on the accounts you’re already connected to. Hunt down Twitter feeds for jobs at organizations or in areas where you want to work, and your timeline will soon fill up with positions of interest. If you don’t want your main Twitter feed affected, add these job accounts to a dedicated list by clicking the three dots next to the Follow button and choosing Add or remove from lists. You can then load up your jobs list from your profile page whenever you want to check the latest postings. Twitter is more open and expansive than Facebook and lends itself well to a job search. If you’re getting too many hits on a standard search (and you probably will be), make use of the advanced search to narrow the results down by keyword or location. Of course there’s going to be some noise in amongst the good stuff—this is Twitter after all—but you’ll soon get better at sniffing out opportunities. Then there are the hashtags, which is where it might be worth employing the services of something like Tweetdeck so you can see search results pour in in real time. You’ll need to do some detective work yourself to work out the best hashtags to use for your chosen field of expertise, but they exist! For example, here are some posts for #writersjobs and here are some for #developerjobs. Again, use the filters on the left to look by location. Don’t get put off if you’re getting overwhelmed to begin with, because you’ll soon work out the right accounts to be following and the best hashtags to use. Some industries and positions suit Twitter better than others, and again this should be obvious from the kind of results you’re getting. As on Facebook, you can follow the companies you aspire to be employed by to be the first to hear about new openings and to just get a better sense of what the organization is all about. Networking, and following people you’ve never met but would like to work with, is much more acceptable on Twitter than it is on Facebook, so look for the high flyers in your chosen field and see what they have to say. You might even be able to hit them up for some advice on finding the opportunity you’re looking for. LinkedIn is built for finding job opportunities and showing off your professional prowess. So, as you would expect, it’s not difficult to search for available roles here. Even more so than Facebook or Twitter, it’s important to make sure your own profile is relevant, up to date, and showing you off in your best light, because it could make the difference in landing a role. The good news is that employers will often come looking for you on LinkedIn, which is where having the right information in the right places on your profile really pays off. If you’ve not spent much time on the site you might not know all the ways you can promote yourself—you can post links to your work, where available, like and comment on posts just like Facebook, and list your interests. Anything that makes you stand out from the crowd is going to help, including a profile that looks regularly maintained. Start at the jobs page on LinkedIn and you can browse by job title and location using the search boxes at the top. The boolean operators you might know from Google apply here as well, so you can use the minus symbol (“-”) in front of words you want to exclude from the results and the plus symbol (“+”) in front of words you definitely do want to include. If you’re getting too many hits to wade through, click All filters to narrow down your choices by job type, experience needed, industry, and location. You can also click Create search alert to have matching jobs sent straight to you in the future. You’ve got two more options when it comes to LinkedIn: Networking and groups. Networking is perhaps what LinkedIn is best known, for but remember connecting with people you don’t know is frowned upon—stick to the people you’ve actually met and worked with, and don’t be shy about cementing a connection once you get in touch with someone, as it’ll open up more recommended contacts. As on Facebook and Twitter, following companies you’re interested in working for is a useful way of finding out about jobs as they’re posted and just generally learning more about how the company thinks and works. Stump up for a premium plan and you can even see job changes at a company (perhaps alerting you to an opportunity), as well as compare yourself with other candidates in a job selection process, and see who is viewing your LinkedIn profile. As for groups, they can come in useful mainly for staying up to date with industry trends and news, whatever your calling is. Start at the groups discovery page and work out from there—you can also find groups through the good old search box and find extra resources that way. If you want to pool your job-seeking resources with like-minded individuals, you can even create a group of your own.